Hyderabad, Mar 05: The much anticipated #Brahmastra logo is out. Dharma Productions and the makers of Brahmastra film have chosen to launch the logo on the auspicious Mahashivratri, at Kumbh Mela, Uttar Pradesh. The team has been intimating people about the updates of the launch from the morning. 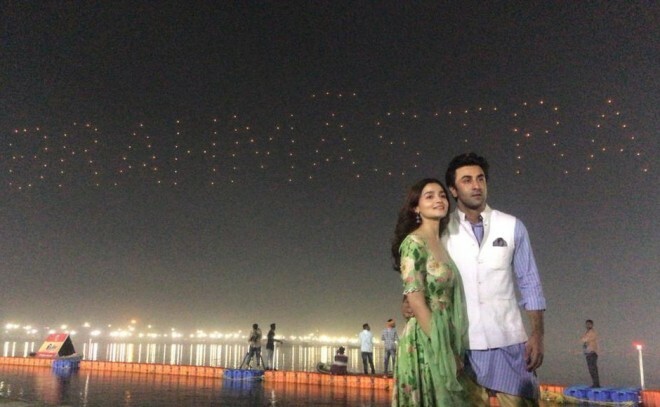 Alia Bhatt, the lead actress of the film has put up a live video on Instagram sharing the spectacle where 150 drones lit up the whole sky forming the #Brahmastra logo making it one of a kind of logo launch. The usage of drones and light flyers is something we haven't seen earlier with any film. The event started with a tribute that has been paid to Kumbh 2019, followed by the logo launch. Alia along with Ranbir was thrilled about launching the logo in such a grand way. Brahmastra, the film, stars Alia Bhatt and Ranbir Kapoor, is directed by Ayan Mukherji and will be a three part series. The first part of the franchise will supposedly hit screens on December 25th, 2019.